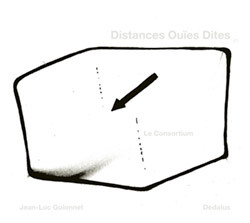 A very interesting live recording of a composition by Jean-Luc Guionnet, performed by the Dedalus ensemble: Didier Aschour (electric guitar), Vincent Bouchot (voice), Cyprien Busolini (viola), Eric Chalan (double bass), Thierry Madiot (trombone), Christian Pruvost (trumpet) and Deborah Walker (cello). The recording was made at Le Consortium in Dijon, France on March 1st 2013, with each instrument playing from a different room, the viola being the only instrument in the same room as the audience. The composition itself has a lot of space, often featuring lone sounds from far away. There are repeated phrases that rise and fall, occasionally slightly obscured by something from another location — as when a bus passes in front of a street busker. Each instrument is colored by its room, lending the whole a fuzzy, reverberant cast: a small chamber ensemble in exploded view. When sustained chords gather, they seem to hover around or beneath the viola, adding shifting harmonics, a cloud of singing tones. At one point I began to wonder if anyone had taken the time to figure out the resonant frequencies of the various rooms and whether or not this featured in the endeavor. A handy map of the venue in included, giving the listener a clue as to various distances and room sizes. The title translates as "Distances : Hearsay", evoking thoughts of things passed on from afar, and not quite properly heard. This would have been marvelous to witness live.